There is nothing easier than making this tangy, tasty Plum Butter in your slow cooker. It’s great to use as a spread on breakfast rolls, bread, pancakes or muffins or to swirl into your yogurt or breakfast bowl. A great way to start your day! What do you make when you are gifted with twenty-one pounds (!) of Italian prune plums? I cannot tell you how excited I was when my neighbor gave my husband a big box of Italian prune plums. Anyone that has an Italian prune tree growing in their backyard will tell you that when the conditions are right, a mature tree will give you with A LOT of fruit. My neighbor has two such trees so you can only imagine his harvest! Italian Prune Plums are available from early September to early October. This egg-shaped fruit has deep purple skin with yellowish colored flesh. When purchasing, always look for firm plums -they’ll need to soften before eating or baking with them. 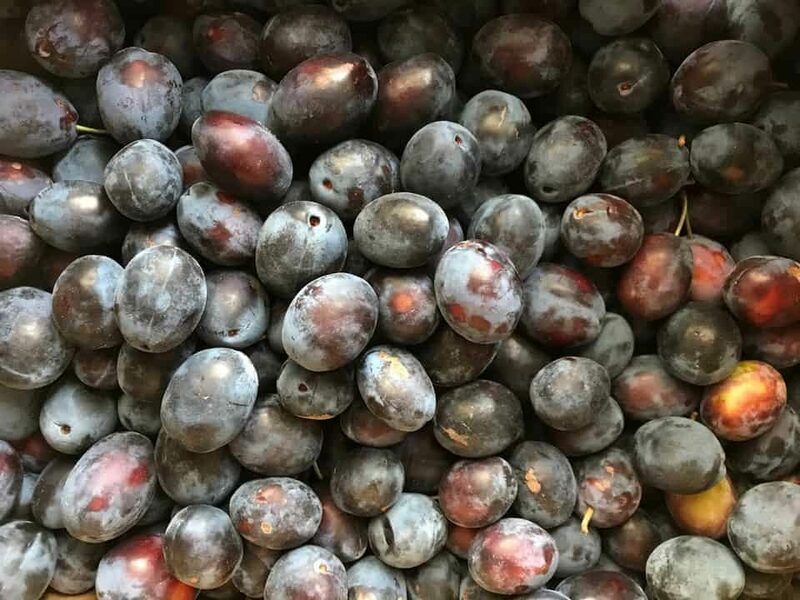 It is interesting to note that these Italian Prune Plums can also be referred to as sugar plums, Jersey plums, Empress plums or Stanley plums. Scientifically known as prunica domestica, these are the plums used to make dried prunes. But that’s not what we are making today! The first is this lightly spiced apple butter, which, I assure you, will have you eating it by the spoonfuls, right out of the jar. My personal favorite (to date) is this wonderful, simple crock pot recipe for vanilla pear butter. Every year, my pear tree provides me with the opportunity to make dozens of jars of this fruit butter recipe. They make the best hostess gifts, especially during the holiday period. It can be used as a topping for ice cream or ricotta. So, with my recent gift of twenty-one pounds of Italian plums, it was only natural for me to make plum butter. I took advantage of having so much fruit by testing a few flavor combinations. The first thing we are going to do is to properly rinse the prune plums. Next, we need to slice them in half in order to remove the pit. Pro Tip: A good indicator to determine if the plums are ripe is being able to easily remove the pit from the fruit. Since we will be using about four pounds of Italian Plums for this recipe, I like to place a large empty bowl on a scale. In this way, I can easily see when I reach the desired weight. At this point, we are going to do something a little unconventional and roast them. So, we need to line a large baking sheet with parchment paper. Pro Tip: Italian plums release a lot of juice, so make sure to extend the parchment paper over to the sides so that none of the cooking juices escape. 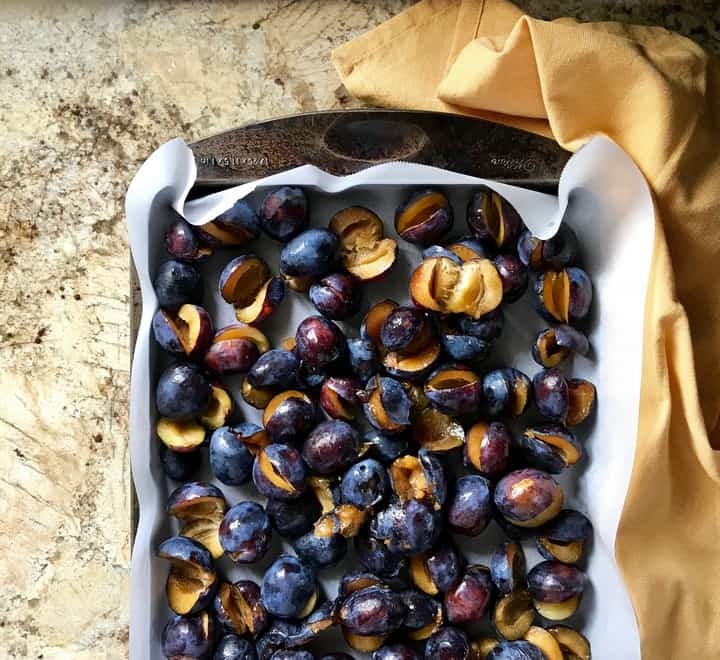 Spread the sliced prune plums in an even layer on a parchment lined baking sheet and sprinkle with 1-2 tablespoons of brown sugar. Variation 1: Remove the skins from the Italian prunes. They should just slip off. If they don’t, put them back in the oven and bake for another 15 minutes or so. Once most of the skins are removed, carefully transfer the skinless prunes and all of their juices to the slow cooker. Add 1/2 vanilla bean (split lengthwise to release the seeds) as well as three strips of orange peel. Variation 2: Carefully transfer the Italian prunes and all of their juices to the slow cooker, this time with the outer skins. Add 1/2 vanilla bean (split lengthwise to release the seeds). As an optional flavor enhancer, add 1/4-1/2 teaspoon of almond extract at the end of the cooking time. Variation 3: Carefully transfer the Italian prunes and all of their juices to the slow cooker (either with or without their skin). Add 4-6 apples (peeled and cut into large chunks). As an optional flavor enhancer, add 1/4-1/2 teaspoon of nutmeg at the end of the cooking time to this batch. Variation 4: Carefully transfer the Italian prunes and all of their juices to the slow cooker (either with or without their skin). Add 4-6 pears (peeled and cut into large chunks). Add 1/2 vanilla bean (split lengthwise to release the seeds) as well as three strips of orange peel. Once you have chosen one of the above variations, set the slow cooker on high for about 2 hours or until the fruit has totally softened. Remove the vanilla bean and orange peel (if using). With the help of an immersion blender, puree until smooth. If you do not have an immersion blender, transfer the mixture to a food processor and process until you obtain a smooth texture. At this point, notice how the fruit puree has a very high moisture content. We need to continue cooking it in the slow cooker, this time on low. As it can take up to 10 hours for the liquid to evaporate in a slow cooker, this is the perfect overnight recipe. There is no need to stir. Just set your slow cooker to low and allow it to do all the work. In the morning, check the consistency and adjust the taste for seasonings and sweetness. You can sweeten the tartness of the plums with maple syrup or even honey. I find that the batch I made without the skins required no sweetener. A squirt of lemon juice also balances out the overall taste. As I mentioned, experiment with different flavors… you really can’t go wrong! The final thing to do is to ladle the plum butter into sterilized canning jars. 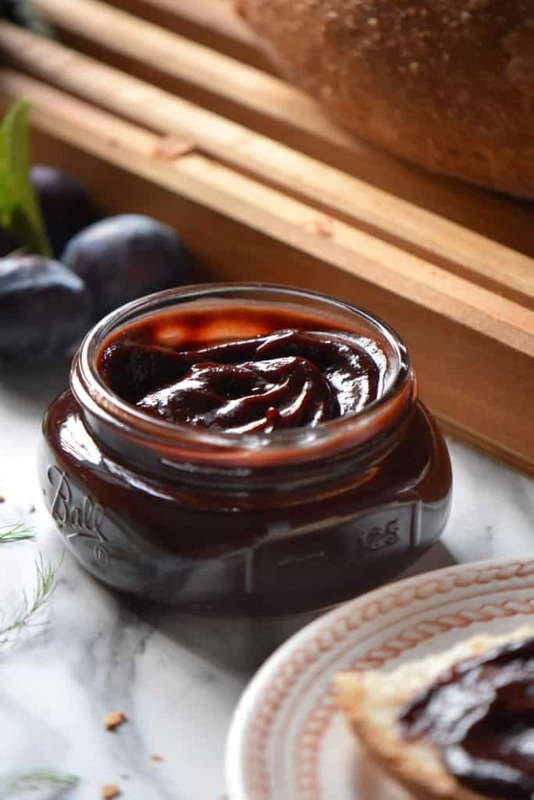 The slow cooker plum butter can now be processed in a water bath and then stored at room temperature for up to one year. Another option is that once the jars have been filled and cooled to room temperature, they can be frozen for up to one year or refrigerated for up to two weeks. Growing up Italian meant that not only did we have a vegetable garden, but there were all kinds of fruit trees growing in our backyard. Some of these included peaches, pears, apples, figs and naturally a few Italian prune plum trees. 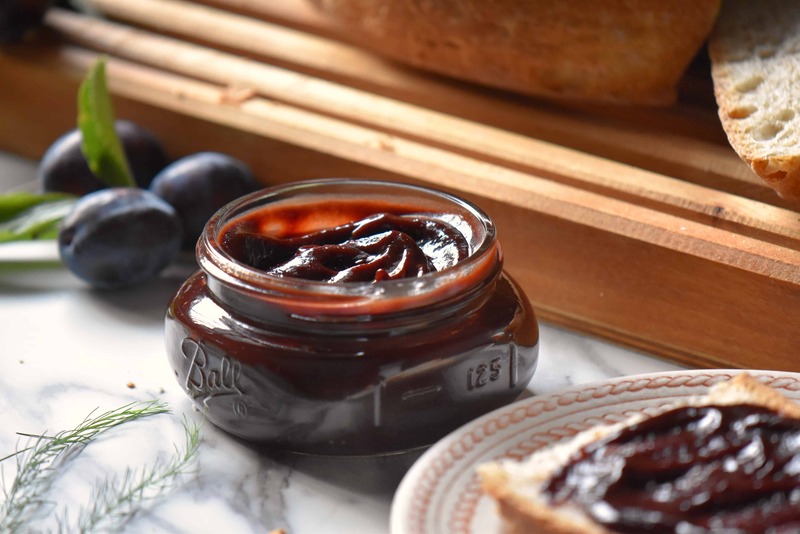 I can still envision my mother stirring heaps of prunes in a large pot, trying to cook them down into a jam/butter consistency to make her prune crostata. Needless to say, if you have ever cooked Italian prunes on the stove top, it can get very messy. 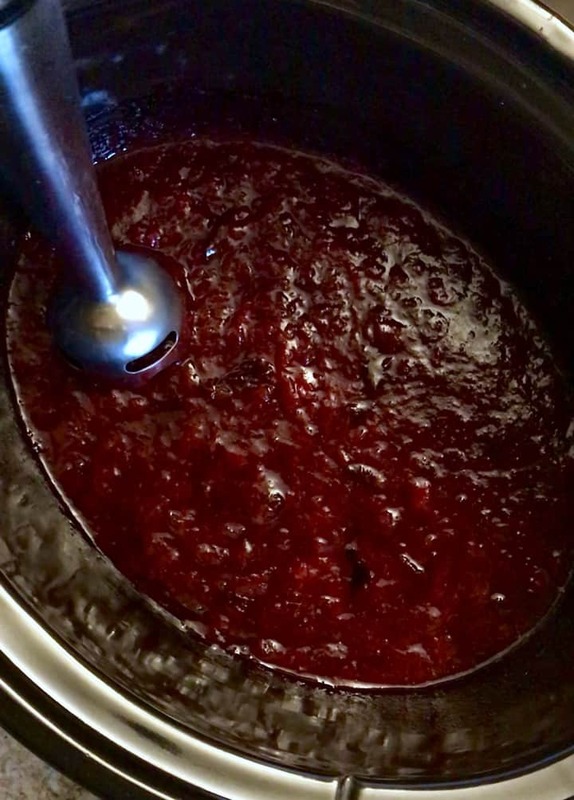 Fortunately, I discovered how easy it is to make fruit butters in a slow cooker. 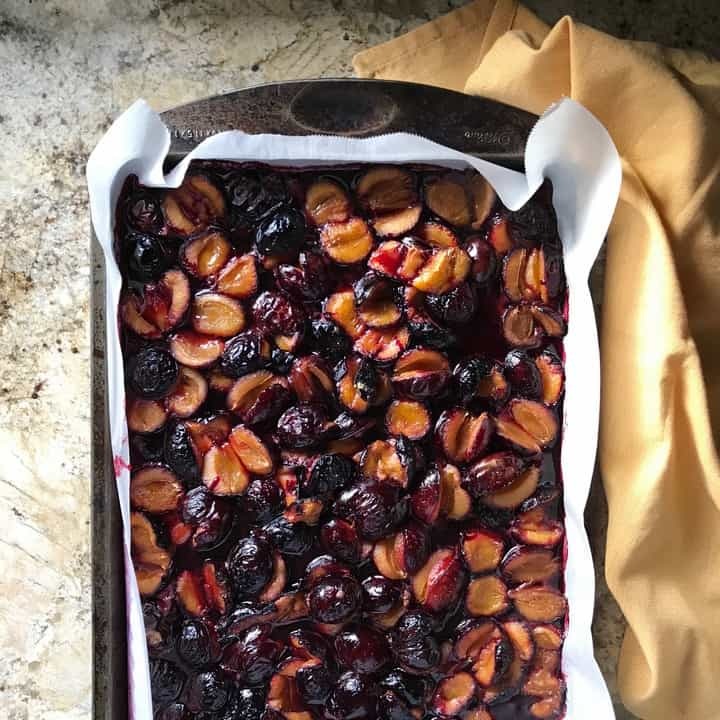 Recently, I came across this recipe for a galette recipe where the plums are roasted before making the filling for the pie. The roasting of the prune plums truly intrigued me. I couldn’t wait to try roasting the plums, especially when I received this generous gift. I knew I just had to try this and I’m thrilled with the results. Thanks for the inspiration Denise! 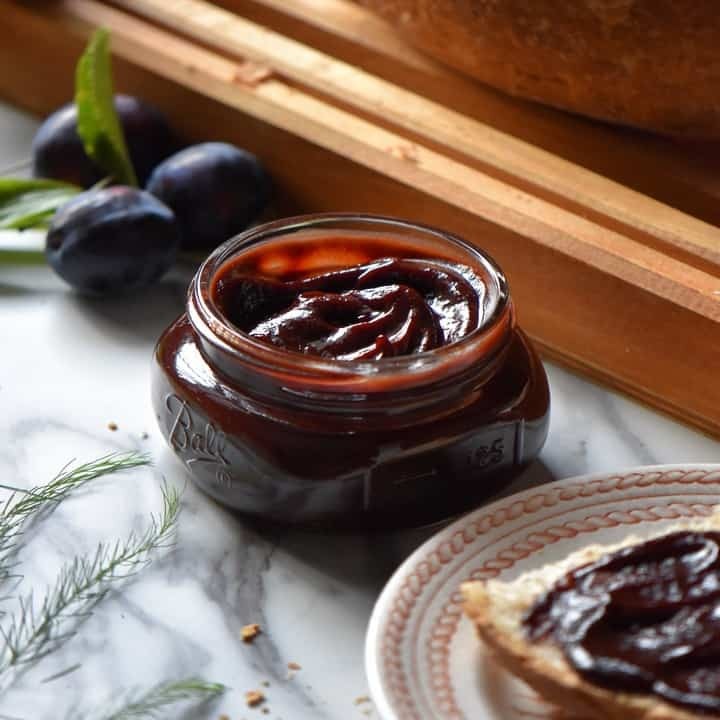 So, if you are still dealing with an abundance of Italian prune plums, I suggest you make any variation of this tangy plum butter recipe… or better yet, make your own variation. I would love to hear about it! 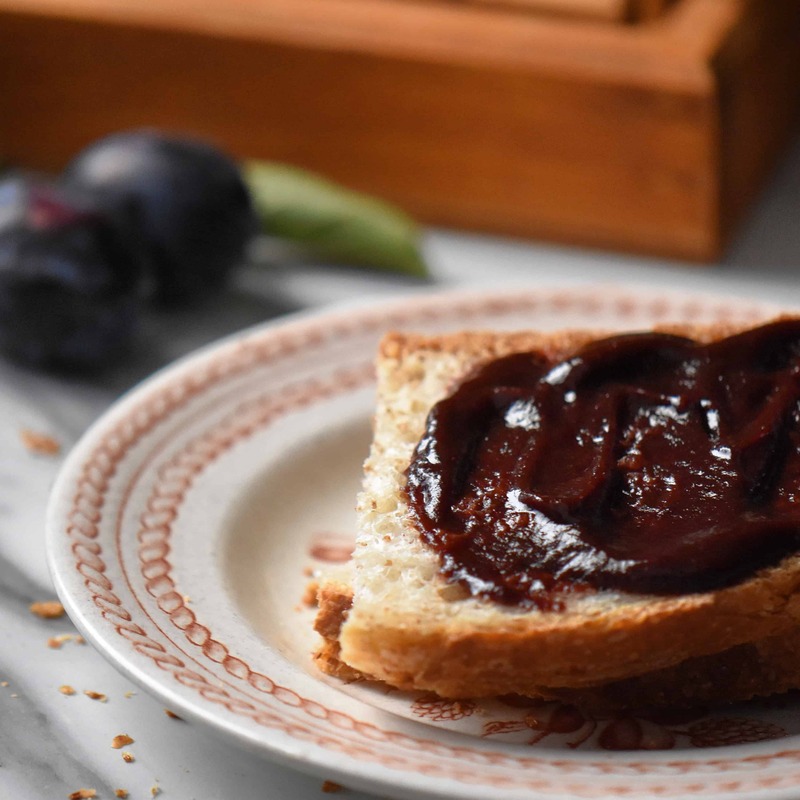 With its deep blue-purple color and slightly tart taste, your family and friends are going to love this fruit spread! 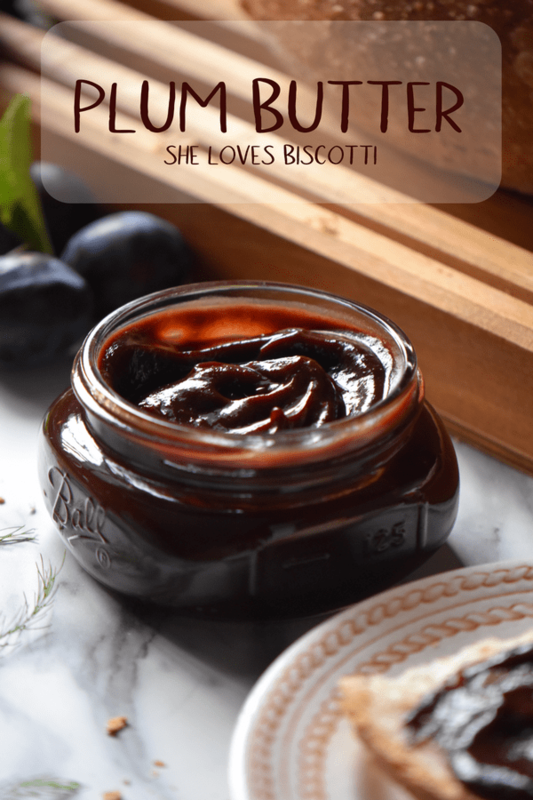 ★★★★★ If you have made this plum butter recipe, I would love to hear about it in the comments below and be sure to rate the recipe! With its deep blue-purple color and slightly tart taste, your family and friends are going to love this slow cooker plum butter! Spread the pitless prune plums evenly on the parchment lined baking sheet. Sprinkle the prunes with about 1-2 tablespoons of brown sugar. Bake for about 30-40 minutes or until the skins can easily be removed. 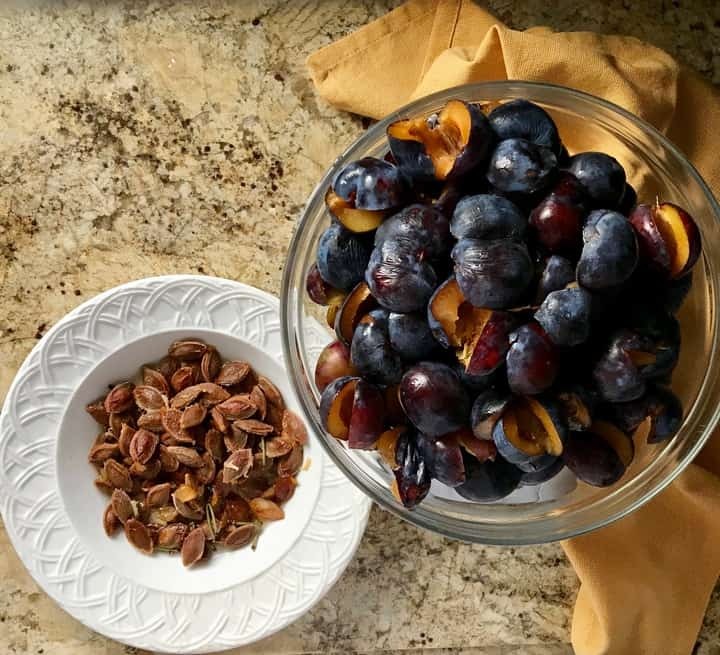 Transfer the prunes, WITHOUT the skins and all the juices to a slow cooker with the addition of the vanilla bean and orange peel. Transfer the prunes, WITH the skins, and all the juices to a slow cooker with the addition of the vanilla bean. Add 1/2 teaspoon of almond extract at the end of the cooking time. 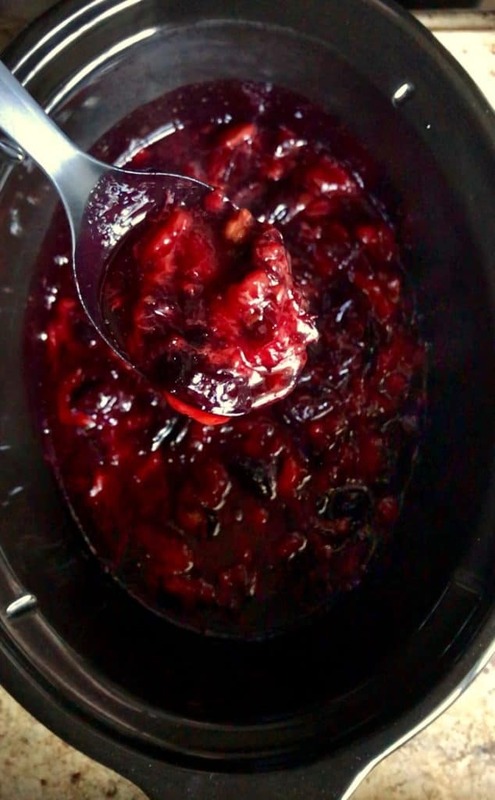 Transfer the prunes (either with or without their skins) and all the juices to a slow cooker with the addition of the apples. Add 1/4 teaspoon of nutmeg at the end of the cooking time. Transfer the prunes (either with or without their skins) and all the juices to a slow cooker with the addition of the pears, vanilla bean and orange peel. Once you have decided on one of the variations, set the slow cooker on high for about 2 hours. Remove the vanilla bean and orange peel, if applicable. With an immersion blender, puree the softened prunes until smooth. Set the slow cooker on low and cook for an additional 8-10 hours. Total time will depend on total moisture of pureed fruit. The plum butter is done when there is no liquid that seeps out when a teaspoon of the fruit is placed on a dish. OPTIONAL: Can use a few tablespoons of maple syrup or honey to sweeten the plum butter. Can also use a squirt of lemon juice to even out the flavors. Ladle the plum butter in sterilized jars and process accordingly. Well, I am a bit late for Plum Butter but your recipe(s) are idea for all of the fruit you mentioned. Such a wonderful way to utilize the bounty from our local trees. As winter approaches, these butters bring us a bit of the flavors of late summer and fall. This sounds wonderful! Which variation would be your favourite? Thanks so much Lynda! I really liked the version with the pears. The overall flavor was more delicate. My family preferred the first version as there was less “tartness” to the plum butter. It was fun to have experimented with this wonderful fruit. Thanks so much for stopping by. Enjoy! What a great recipe! 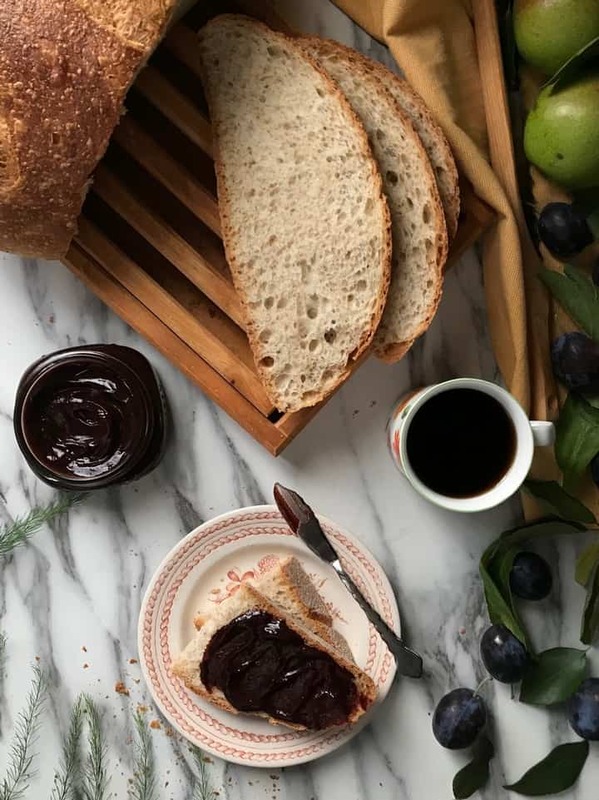 My daughter is in Italy for the year and has enjoyed crostata made with a plum preserve which she says is not terribly sweet. I can’t get that here but I’m thinking this plum butter sounds like just the thing. Can’t wait for stonefruit season here in Australia. Definitively one of my favorite ways to use this plum preserve is in a crostata. That texture! Silky, smooth, rich. And that deep color, just gorgeous. I know I would make good use of this amazing butter, at breakfast, in my baking, on a cheese board. Love all the variations!